Lord Seven Monkey was a 16th-century Mixtec priest and a descendant of the famous Lord Eight Deer. After the Spanish conquest, he was baptized and changed his name to that of the founder of the Dominican order, Santo Domingo de Guzmán. In 1544, he was accused of practicing idolatry with twenty sacred bundles that he and two other priests kept hidden in a chamber within the royal palace. The idols contained in the bundles represented the gods Saqhi or Lord Seven Earthquake and Qhuiyo or Lady Nine Reed among others. 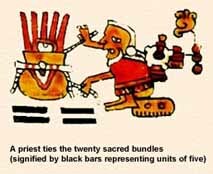 The trial proves to us that the Mixtec codices were more than anecdotal histories, they were holy books. Lord Seven Earthquake is portrayed in Codex Nuttall as a hero sacrificing a Stone Man in the War of Heaven. Being descended from such divinities, Mixtec kings and queens were called "Yya" meaning either "lord" or "god." While most Mixtec gods appear as distinct individuals, others seem to have shared attributes with their Eastern Nahua counterparts. Qhuiyo (Nine Reed) for example was worshipped by the Eastern Nahua as Ixquina. Qchi (Nine Wind) was Ehecatl Quetzalcoatl and Qcuañe (Nine Grass) was Cihuacoatl. These alternate cultural manifestations may have presided over comparable realms of spiritual affairs but it is also important to remember that they could be regarded as very different incarnations of the supernatural by the various peoples who worshipped them.